PAMIS is delighted that their work through the Changing Places Consortium was shortlisted as an ‘Innovative practice’ and the Consortium was invited to the conference in February 2014 in Vienna to present their work. Joyce Burns, a Clinical Specialist OT from NHS Tayside and advisor to PAMIS on the specifications of these facilities, represented the Changing Places Consortium at the conference. 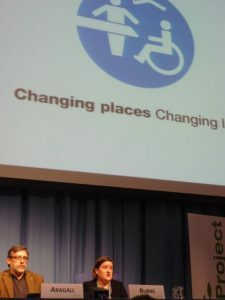 This was a wonderful opportunity for the Consortium to spread the word on the importance to people with complex disabilities and their families of fully accessible toilets. A great deal of interest was shown by the other delegates and we are looking forward to seeing Changing Places toilets becoming commonplace across the world.